The cathedral is important not only for military reasons but also for Russian cultural history. Writer Fyodor Dostoyevsky married Anna Snitkina in the cathedral in 1867. The restoration of one of St. Petersburg’s largest but least-known houses of worship, the Trinity Cathedral, started 21 years ago and is finally completed. We look at six of the most important facts from the cathedral’s history. In the mid-18th century the site now occupied by the cathedral had a small church built for the Izmailovsky regiment, the elite group of soldiers created in 1730 by Empress Anna to personally serve the Russian ruler. The soldiers lived in nearby barracks and since they did not have a permanent base it was decided to erect a field tent and consecrate it as a church. In 1734 a wooden church was built on this site, and Empress Anna presented several priestly robes. While its first commander was an ethnic German, General Karl Gustav von Lowenwolde, subsequently, the regiment’s honorary commanders were members of the Romanov family, including Empress Catherine II, Emperor Paul I, and Grand Duke Nikolai Pavlovich, who later became Nicholas I. The Izmailovsky regiment took part in a number of major battles, including the Siege of Ochakov, the Battle of Austerlitz, the Battle of Borodino, and the Russian capture of Paris in 1814. In 1754, a new five-domed church (also wooden) was built for the regiment, and which survived until 1828. In 1828, Empress Maria laid the first stone of the current cathedral's foundation, and construction was personally paid for by her husband, Emperor Nicholas I, who was the regiment's commander. He decreed that the new cathedral be large enough to accommodate 3,000 people, and be modeled on the same design as its wooden predecessor. Nicholas I personally supervised the project, and the architect Vasily Stasov carried out his wishes crowning the cathedral with five domes. 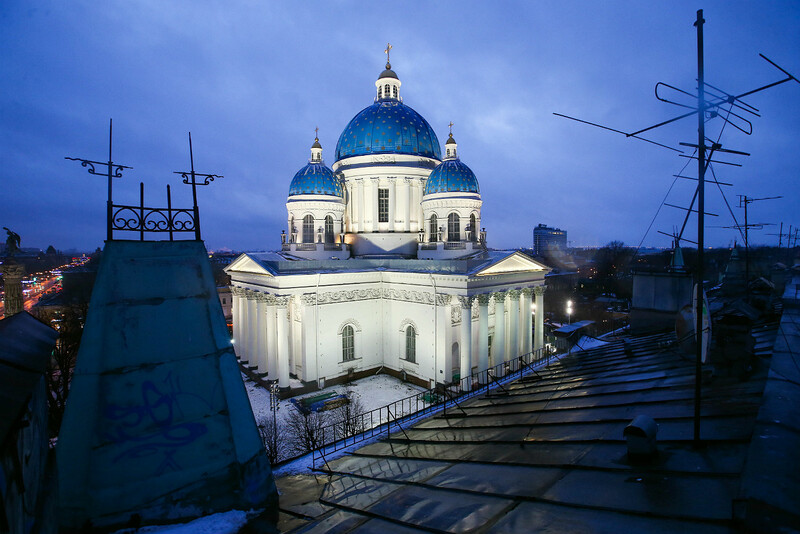 Even before construction began, the emperor ordered the domes to be painted blue with stars --- the same as the Archangel Cathedral in Moscow. The small domes are situated not diagonally, but at the four points of the compass, located so close to each other that from a distance one thinks they are a single large dome with shining golden stars. The cathedral’s main dome is Europe's second-biggest wooden dome. The cathedral housed the Izmailovsky regiment’s official colors and battlefield trophies, including keys to the fortresses of Beyazit, Nikopol, Adrianople and more, as well as captured enemy flags. Plaques in memory of regimental officers killed in battle were mounted on the cathedral's walls. The Trinity Cathedral was in fact one of the first regimental cathedrals to have such plaques. Often soldiers who had served in the regiment upon retirement would donate their military medals to the cathedral. When the emperor banned this practice, the medals that had already been donated were melted into a frame for an icon of St. Nicholas the Miracle Worker. In 1886, Emperor Alexander III unveiled the Column of Glory to commemorate the victory in the Russo-Turkish War of 1877-1878. The column stands in front of the cathedral, and was made from the barrels of 108 Turkish cannons seized as trophies, and on top was a winged figure of Victory holding a laurel wreath. Next to the monument were captured Turkish artillery pieces. In the 1930s, however, the monument was dismantled and melted. Only in 2005 was the Column of Glory restored and returned to its original spot. The cathedral is important not only for military reasons but also for Russian cultural history. Writer Fyodor Dostoyevsky married Anna Snitkina in the cathedral in 1867. In addition, the cathedral has St. Petersburg’s oldest icon -- the Holy Life-Giving Trinity painted in 1406. The cathedral is registered with UNESCO as a part of St. Petersburg's historic center. The Soviets closed the cathedral in 1938, and for many years it served various mundane purposes. The basement, for example, was used to store vegetables for a nearby market, while the rest of the building served as a warehouse. There were plans to replace the cathedral with a tram depot and later, to convert it into a conservatory hall. These plans were never realized, and then after the fall of communism the cathedral's restoration finally began in the 1990s. A major fire broke out in 2006 causing considerable damage to the dome. Reconstruction required special building techniques to be devised, and surviving photos made it possible to recreate the main chandelier. After 21 years the restoration of one of St. Petersburg’s least-known but massive cathedrals has finally been completed.